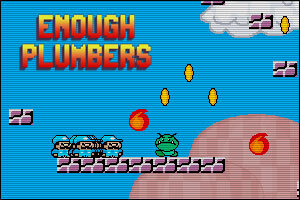 Enough Plumbers is a retro Puzzle Platformer created by Glen Forrester & Arthur Lee where your goal is to make your plumber reach the flag in each level. To do so, you will have collect coins: each coin gives you a cloned plumber. Move around with all your clones, catch power-ups, kill enemies, and with the help of your clones, master the 25 levels of the game! lol, this game is copying Mario. Posted on Thursday, April 22nd, 2010. Follow any responses through the RSS 2.0 feed.